Of those artists throughout the world who have dedicated themselves to the automobile, only a select few have achieved worldwide renown - one of them being Walter Gotschke. Road & Track dubbed him "perhaps the world's greatest automotive artist." 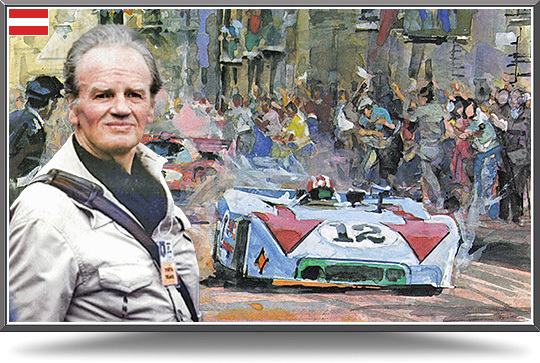 His impressionistic gouaches not only portray the typical character of each race driver and his driving style, along with the authenticity of an historic event and cars true to the smallest detail, but also make the race atmosphere palpable, so that one can almost hear and smell the event from his art. This self-taught artist was born in 1912 in a village of imperial Austrian Silesia (now Czech Republic) but lived and worked in Stuttgart, Germany from 1938. Gotschke drew passionately even as a child, commencing with animals. Aged 11 he became fascinated by the first automobiles. From memory alone he tried repeatedly to draw the few cars that passed through his rural backwater. The later student of architecture experienced his first races in his homeland: the Ecce-Homo Hillclimb, the Masaryk Grand Prix and others. By seventeen his race sketches were published, followed a year later by the Masaryk Grand Prix poster. Alongside decades of advertising work for Mercedes-Benz, Ford, Fiat, VW, etc., Walter Gotschke's favorite task was painting automobile races. During his later period of life this evolved to become his chief activity, and he was honored as an emeritus by the distinguished Automotive Fine Arts Society. His art has been featured in major publications around the world including Motor Revue, Sports Illustrated, Auto Motor und Sport, and Automobile Quarterly. In 1985 an eye disease gradually turned into blindness and by the autumn of 2000 his eyes closed for ever. By special arrangement with Gerhild Drücker-Gotschke, Car Art, Inc. is honored to offer the Memories of an Enthusiast Collection -- a series of limited edition prints signed by the great Walter Gotschke. Photo and text used with permission of Gerhild Drücker-Gotschke.